The land on which ‘The Spark’ is built consisting of a central house, a warehouse and vegetable garden- had been abandoned more than 20 years. In 2008, a group of young people decided to occupy and reform it. The cleanup and reconstruction gave way to a living space, garden groups and a social center, with a host of political and cultural activities. Immediately in the year 2008 a judicial process began, which despite having suspended on occasion, has continued to this day. Police identifications occurred around the house and the Autonomous Police used the license plates of cars parked within the premises to investigate their owners. The court case was opened against five of these people, but finally went ahead for only four of them, since one was not located. Before the arrival of CSO La Chispa there were a few difficult experiences of occupàtions in West Catalonia, which, however, were barely visible and short lived. According to the book ‘Memory freedom. 100 years of the libertarian movement in Lleida’ (published by the Federation of the CGT Intercomarcal Lleida) the first occupations in the city did not take place until 2003 with the CSO Kan and The Vine Yard. Previously however, there was the project in Balaguer, in 1996 when thirty young people okkupied what is called the Via Kasa. Regarding the movement in the capital LLeida, we must add some more projects located in different parts of city, such as The Kask (2004 squatted Historical Center), La Cage (2005, located in the path Llívia) and the Rage (2007, located in the district of Pardinyes). However, all these previous experiences were short-lived. In this context, in December 2007 a group of young people from all over Catalonia decided to undertake the project of La Chispa CSO….The SPARK. It was also the time when we begin to organize collective support for the struggle of prisoners in west Catalonia, which has continued over time as in the case of three Lleida youths , who have recently been sentenced for holding a pacifist protest. La Chispa collective have initiated many workshops, lectures and activities to ensure financial support of the project. From the start the we had to deal with the difficulties of an abandoned house without energy resources and applying the principles of self-management. This is why the CSO La Chispa has been always with solar panels and electric batteries that have supplied much of the power to the space. In addition, these values were also extended to other aspects of their daily lives, such as food, using as a basis the recycling of food markets, fruit and vegetables. This has meant that during those nine years the group has been able to take part in workshops and activities Plan of the social movements of Lleida. From 2013 the center became an inspiration for other anarchist projects like l’Ateneu Llibertari l’Arrel,, the Occupied Police Station La CORB, and l’Assemblea Llibertària. While recognizing that during the first three years we focused efforts on making the project economically self-sustainable, a turning point was the protests carried out in May 2011. From then on we felt the need to contextualize socially and take into account the groups that had been formed in the city. Most important was the 15-M movement and other areas such as the CSA Maranya. 2011 was a time of branching into conscious activism for the members of the Spark, which become part of different groups and projects, as well as opening other occupied spaces within the city of Lleida. During the last year activities at home have increased significantly in response to the possible eviction. From 2013 until today, the CSO La Chispa has become a benchmark for squatting and the libertarian movement in the western Catalonian capital. Who is behind the Eviction Court Case? ”The new owner is a company whose directors are part of the Batlle-Cercera SA, which appeared in the media when the CUP party and FROB (Fund for Orderly Bank Restructuring), opened a case with the Anti-Corruption Prosecutor for alleged illegal financing operations of the Exchange of Lleida”. 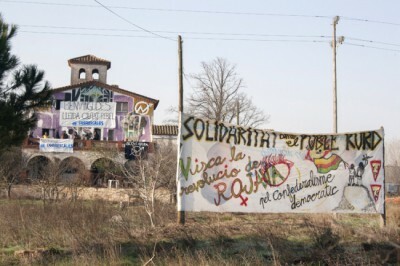 ”Batlle – Cervera has speculation interests behind the trial of The Spark, since its aim is to gain economic benefit of those lands, demolishing the house to continue the capitalist model of leisure in the area”.